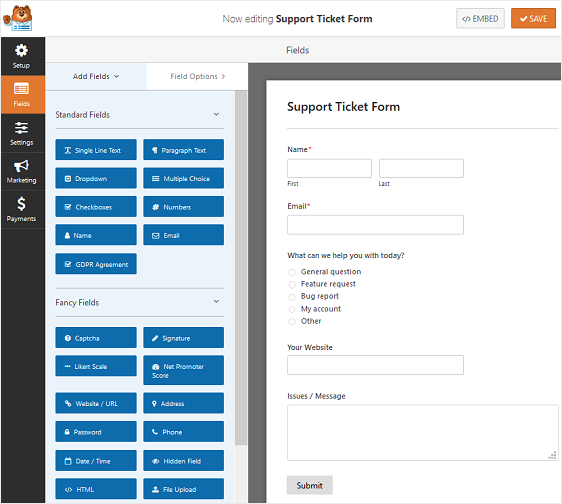 Are you looking to create a customized Zendesk support ticket form in WordPress? With WPForms, you can easily allow your users to request assistance on your site and ask for whatever information you need. In this article, we’ll look at how to create a Zendesk support ticket form in WordPress. Why Use WPForms With Zendesk? 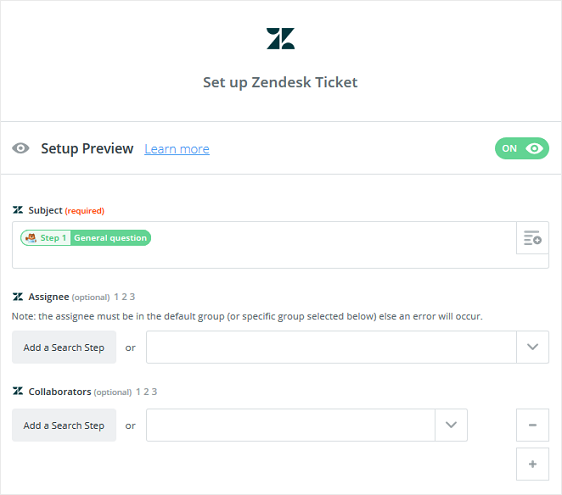 Zendesk is the most popular support ticket system that allows you to track, prioritize, and solve customer support tickets. You can manage all your customer information in one place, which makes communication with your customers easy and efficient. If you want to allow your customers to submit a Zendesk ticket on your site, you can embed a simple contact form using WPForms. But what if you want to customize the form to request more information, add images to your form or other custom HTML, or send additional form notifications when it’s submitted? With WPForms, you can easily create a custom support ticket form in WordPress and connect it with Zendesk. No need to learn any code! The first thing you’ll need to do is install and activate the WPForms plugin. For more details, see this step by step guide on how to install a plugin in WordPress. Next, you’ll need to install and activate the Form Templates Pack addon so you can create a support ticket form. Keep in mind, if you prefer to create a form from scratch, or use a different template, you can. The Support Ticket Form template is just an easy way to get started. To do this, go to WPForms » Addon and find the one labeled For Templates Pack. Click Install Addon and then Activate. Now you’ll need to create a new form. To do this, go to WPForms » Add New, name your form, and choose the Support Ticket Form template. WPForms will create a form for you. For our example, we’ll name our form Support Ticket Form. Of course, this is just to get you started and is geared towards those that provide computer support to customers. You can easily add or remove any form fields you want to customize the support form to meet your needs. To add additional fields to your form, drag them from the left hand panel to the right hand panel. Then, click on the field to make any changes. You can also click on a form field and drag it to rearrange the order. For more help with creating your form, check out this tutorial on how to create a support ticket form in WordPress. After you create your form, you’ll need to install and activate the Zapier addon. The Zapier addon lets you connect your WordPress forms to over 1,000+ web apps, including Zendesk. It’s quick and easy, and the best way to manage support tickets submitted on your WordPress website. For more help with this step, take a look at how to install and use the Zapier addon. 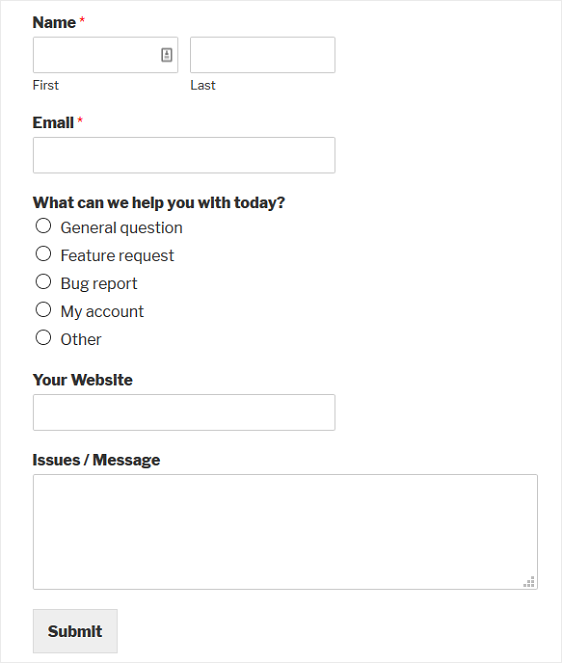 Now, let’s take a look at how to connect your WordPress support form to Zendesk. The first thing you’ll need to do is log into your Zapier account and click on the Make a Zap button near the top of the screen. If you don’t have a Zapier account, you can create one here. Next, you’ll need to choose a trigger app, which in our case is WPForms. Search for WPForms in the search bar and click on it. The only option available will be New Form Entry. Click Save + Continue to make WPForms the trigger when a form entry is submitted on your website. 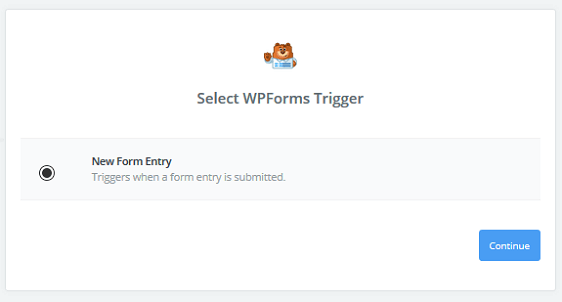 From there, follow the instructions for finalizing WPForms as the trigger app. This will include selecting a WPForms account and verifying that it’s valid. For help with this step, take a look at this step by step tutorial for using Zapier with WPForms. 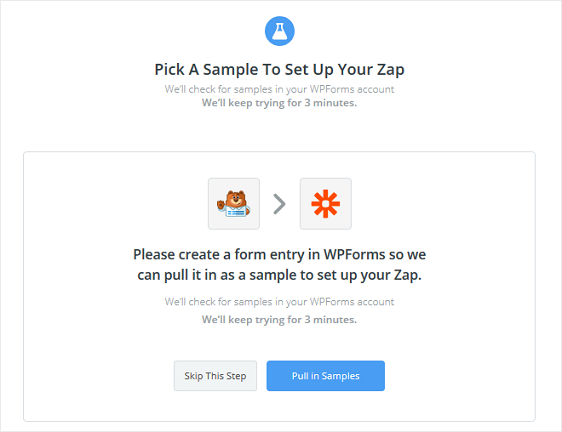 When you finish, Zapier will now be connected to WPForms. When prompted to set up the WPForms entry, make sure to select the new WordPress form you created earlier. Remember, we named our form Support Ticket Form. You will now need to test your support ticket form to make sure it works right. The only way for Zapier to test your form is to have at least one test entry form submitted. To create a test entry so Zapier can fetch and test your WordPress form, navigate to WPForms » All Forms and find your Support Ticket form. Click on Preview. You’ll see a preview of your support ticket form. Fill out the form and submit it as though you’re a site visitor. This will give your support ticket form one entry, which you’ll see in the dashboard. After you have at least one form entry for your support ticket form, go back to your Zapier account and click Pull in Samples. 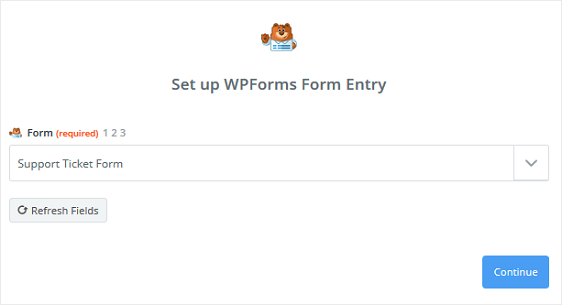 If your test form entry was successful, and Zapier is connected to WPForms, you’ll see the form entry on the next screen. If you click on the dropdown arrow, you’ll see the form fields as they were filled out on your test form entry. Now that Zapier is connected to the WPForms plugin, you need to connect WPForms to Zendesk. To start, search for the Zendesk app in the search bar and select it as the action app. Next, you’ll choose the Zendesk action. Since we are creating a support ticket form to collect site visitor support requests, we’ll select Create Ticket. 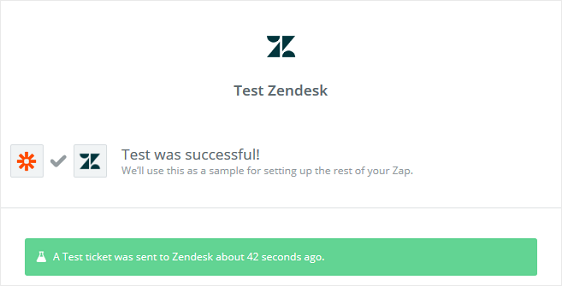 Now you need to connect your Zendesk account to Zapier. 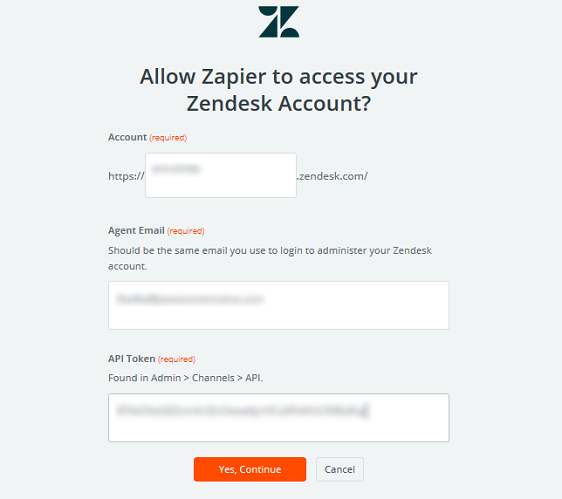 To do this, you’ll need to authorize Zapier to access your Zendesk account by entering your Zendesk account name, agent email, and API Token. 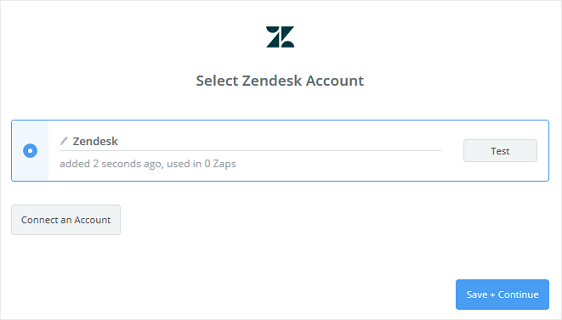 You can find the API token by going to Admin » Channels » API in your Zendesk account. 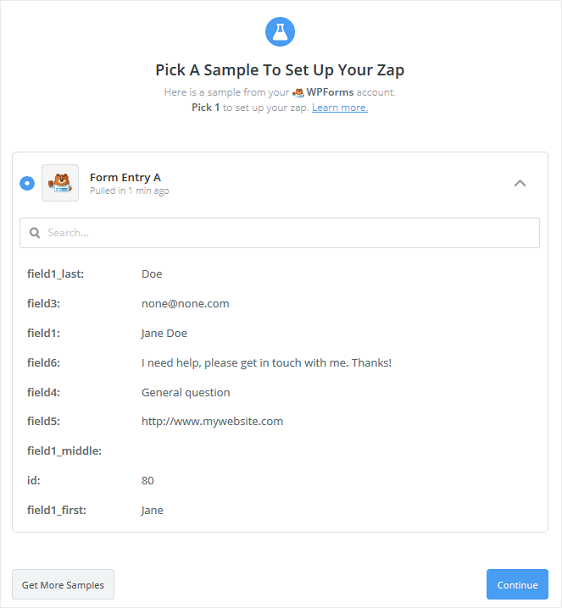 Fill in the requested information in Zapier to connect Zendesk to Zapier. Click Yes, Continue to proceed to the next step. Click Save + Continue to proceed to the next step. Now you need to set up a Zendesk Ticket. In this step, you’ll have to configure the correct WPForms fields in its corresponding Zendesk fields. You can select the right WPForms field by clicking the + icon on each field in Zapier. 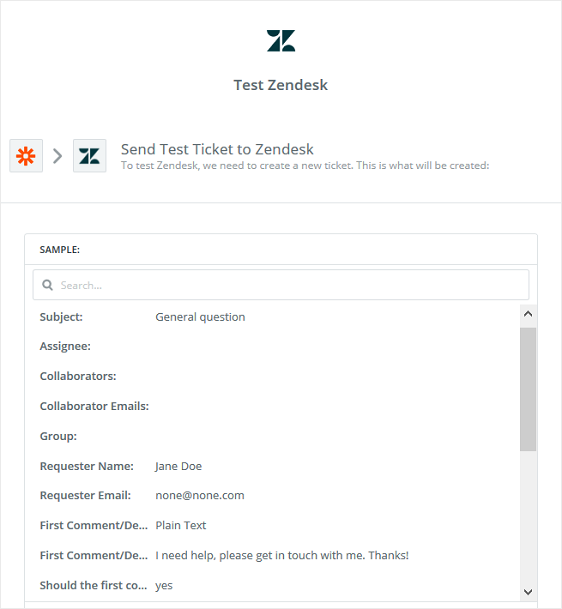 To test the Zendesk ticket, click Send Test to Zendesk. You’ll see a success message if the test went through. 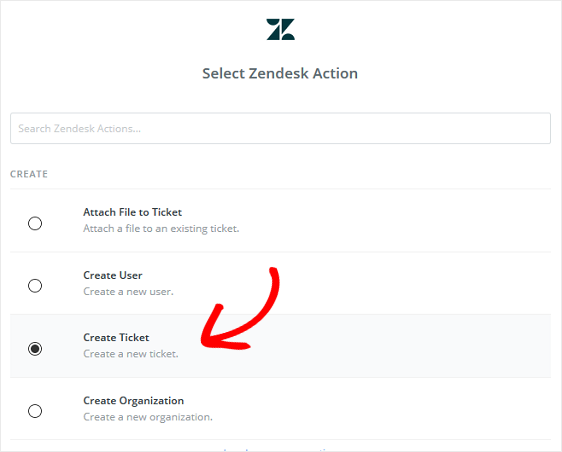 You may log in to your Zendesk account to view the newly added ticket. Click Finish in your Zapier account. 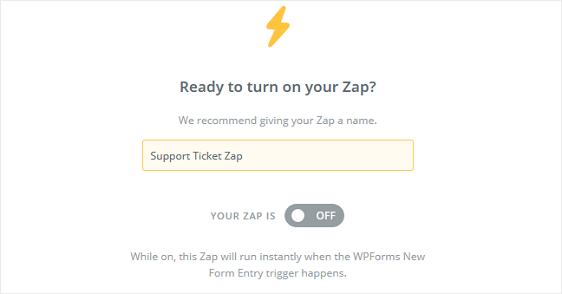 Lastly, name your Zap and turn it on so that when someone submits a support ticket form on your WordPress website, the form entry goes directly to your Zendesk account. You can follow the below tips to speed up your response time and resolution time. These simple things can make your support system more efficient. Ask detailed questions in your support ticket form. This can help you better understand the issues of your customers and resolve them quickly. If you have extensive documentation published on your site, you might want to encourage your users to read it before submitting a support ticket. Tell your customers how long it usually takes to get a response from an agent. This can help your customers to set an expectation on turnaround time. And there you have it! You now know how to create a custom support ticket form in WordPress with Zendesk. If you enjoyed this article, you might also want to check out 3 Form Success Message Ideas to Boost Customer Happiness so that when people submit support tickets on your site, they know right away their request was processed. Better yet, come read about how WPForms is one of Zapier’s fastest growing apps and see why connecting WPForms to Zapier is one of the best things you can do for your business. So, what are you waiting for? Get started with the most powerful WordPress forms plugin today. And don’t forget, if you like this article, then please follow us on Facebook and Twitter. I wanted to let you know about our new WordPress survey plugin that allows you to build interactive polls and surveys within minutes. You also get best-in-class reporting, so you can make data-driven decisions. You can get it 100% free when you purchase WPForms Pro plan. Get Started with WPForms Today and see why over 1 million websites choose WPForms as their preferred online form builder.